What is it? 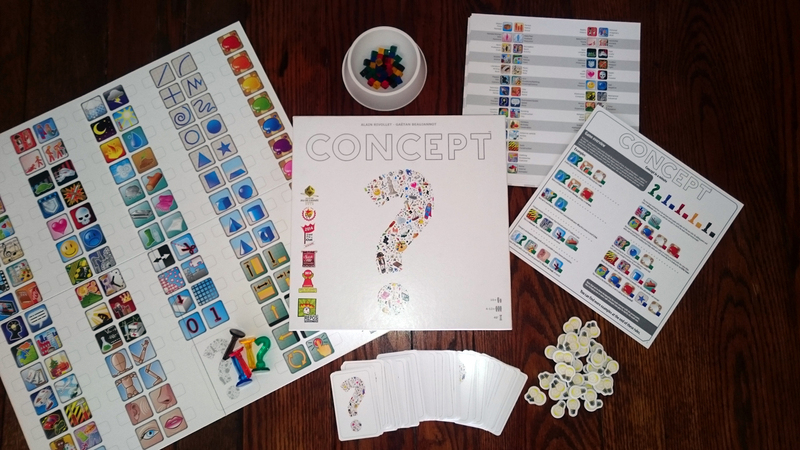 Concept is an award-winning game in which two teams take turns to describe specific words or phrases by placing game pieces on specific icons. Their teammates then attempt to guess what those words / phrases are. Confession time – I generally kinda dislike family gaming sessions. A party game like Pictionary or Cranium is always brought out at family get-togethers. I’m not saying that those games are completely without merit, but you know…. meh. These types of games fall completely flat with me. I’m asked to act / sing / hum, or present awkward drawings (I swear I can’t realistically draw much of anything), and that really holds no appeal for me. It puts me on the spot, and I’m pretty much an “in the background” kinda guy. So I’ve been on the lookout for a game that would appeal to everybody, and hopefully replace the above-mentioned “classics”. Ladies and gentleman, meet our brave challenger, Concept. 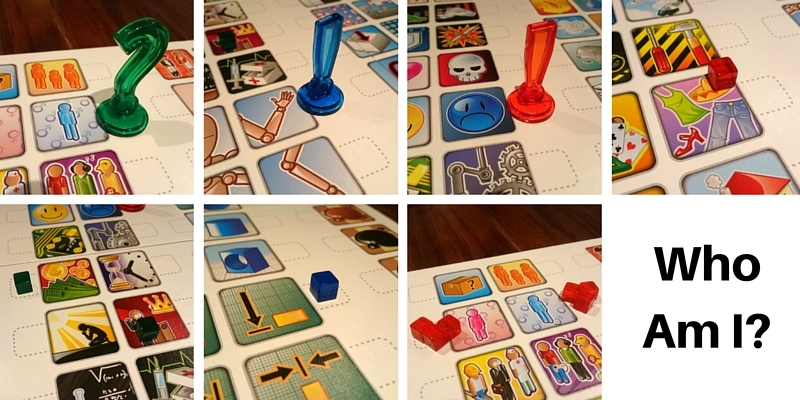 Concept is a party / family game for 4-12 players. Two people form a team that will present the clues to the others. Gameplay is incredibly simple, with a single teammate taking a Concept card, and picking one of the 9 words / phrases (split into three different difficulties – you score more points for higher difficulties) to describe to his / her teammates. The player does this by placing the different coloured clue pawns and accompanying cubes on various icons printed on the main board. No gestures. No spoken words except for “Yes”. No rolling of the eyes. Just pawns and cubes. On top of icons. So it’s essentially a different take on charades, except no more tugging of ears or cranking my invisible camera. You can expand your clues to different aspects of the term you are trying to describe. 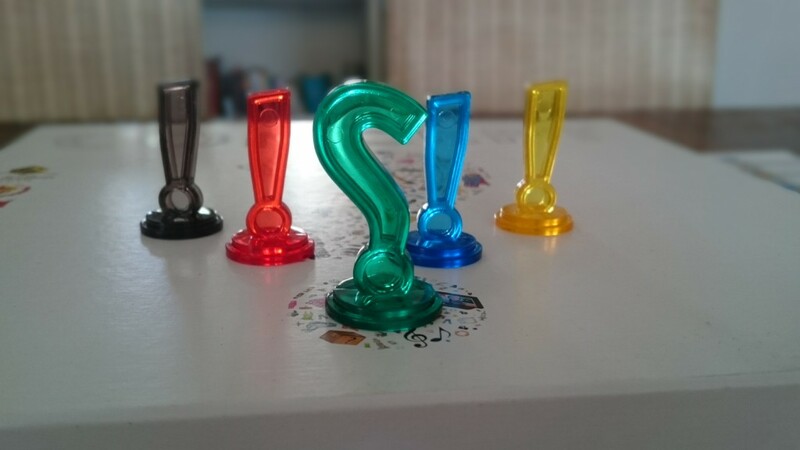 You place the Question Mark pawn on an icon to define the main idea or “concept”, with the 4 sub-concept pawns / exclamations marks (in different colours) used to define other characteristics of the secret word or phrase. The coloured cubes are used to further describe the ideas represented by the pawns. Included in the game are 4 player aids, which show off all the various icons on the game board, and their meanings. The individual player that guesses correctly, receives 2 victory points (tokens), and the team that described the clue gets a single point as well. 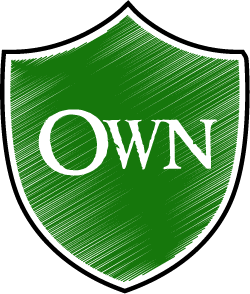 The game caters for using your pawn and cubes in different ways. So we’re looking at an animal, that’s very tall / large, it’s green, and old. Actually, it’s very old since the player has placed multiple cubes on the age icon to emphasise the age. So this could either be a dinosaur, or the dark lord Cthulhu. Because this is a family game, I’m guessing that dinosaur is correct. Pity. Another, but let’s use more attributes to expand the clues. The main concept is a book, but it’s connected with a television somehow. So could it be a book derived from a tv show, or a tv show based on a book? The red sub-concept pawn is describing another aspect. It’s a toy or game, with fighting involved, and a wall? The final cube describes politics, but the cube is placed on a crown so that leans more towards royalty. Time for one last clue. It’s music that is both cold and hot? Play around with clue a bit more and you could guess that it is in fact the book A Song of Ice and Fire. That means the main concept can only be Game of Thrones (Side note: What, if anything, will happen with Jon Snow in Season 6? WHAT?). The cubes are quite flexible in their usage, so feel free to experiment. Examples: you can use multiples of the cubes on one icon, or maybe stack them / build them in a specific manner. Place them on parts of icons to highlight a specific meaning, or move a cube between different icons to represent a transition maybe. Yes and a little bit of no. But for the largest part, definitely yes. Something that didn’t work for me was the scoring / team system, but that’s a minor obstacle. What we quickly did (and something which the actual rulebook suggests) is completely ditch it. 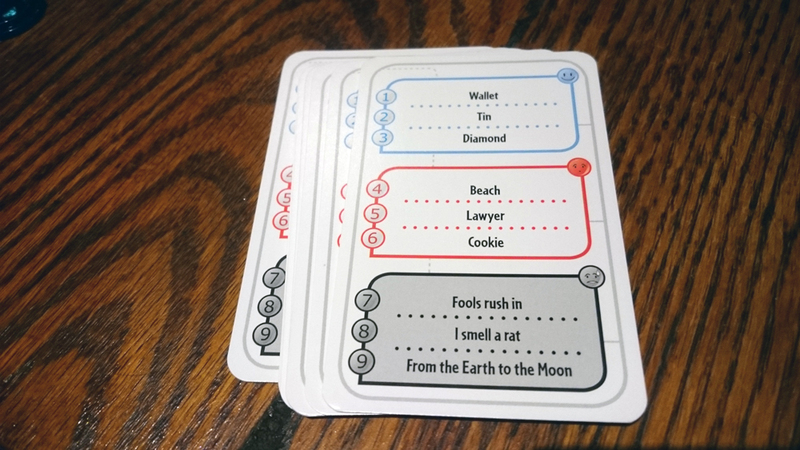 Let players each take a turn to explain a concept, and everybody else can take guesses. This opens up the game for more relaxed sessions, and leaves players to focus on thinking of creative ways to describe their word or phrase. I also decided to disregard the official player-count on the box. I’ve had 6+ player sessions, but I’ve also had great times with only 2 players, the game really is very flexible. Like similar games, a lot of what makes really makes the mechanics shine, are the people you are playing this with with. It has the potential to fall flat if people are struggling to describe something and they can’t quite use the icons and pieces to their potential. That said, the various words and phrases on each card usually serve up at least one option that anybody can explain. Something else to note is that the difference between Easy, Hard or Challenging words can at times be baffling, such as “Rain Man” (Challenging) vs “Museum” or “Heritage” (both Easy). Thankfully you’re not just limited to the cards included in the box for clues. Sure with 110 cards, and 9 words / phrases on each card, you won’t be wanting new cards soon, but expanding is actually quite easy, and the best part – completely free. Because essentially anything can be used as a source for more phrases – open up a magazine or newspaper, browse through your Twitter Feed, scan your Netflix playlist – it really is that easy to keep this game going. Bonus points for anybody that can guess my bad clues (leave a comment below with your answer). Go column by column, and use the Concept Player Aid if you haven’t played this before. It’s great. I’ve finally found my family game. The components are solid, nothing stands out as an exception, but then again that’s not what is required in a game like Concept. What really stood out for me was how amazingly flexible this system is. Descriptions can genuinely scale, either depending on the complexity of the word / phrase, or on the person currently describing clues. You can use insane levels of detail by utilising all the pawns and cubes. You can inject humour by making your descriptions fun. The game really encourages creativity, you’ll end up amazed by what you or others will be able to conjure up later after learning what each icon represents on the game board, and how to link everything together. Concept caters for the 10-year old school student, the 30-year old craft beer-drinking beard-growing hipster, and the 45-year old CEO. And oddly, when describing clues, Concept doesn’t put me on the spot like other games can. It’s a relaxing, fun experience with no pressures. Now excuse me while I try to figure out how to describe the words “Museum” and “Heritage”. Winner. Concept's ability to scale to whoever is playing, and whichever word or phrase is being described, is phenomenal. It's a simple game that can become a complex beast depending on the group playing. I never have to play Cranium again. We enjoyed the game CONSIDERABLY more when we tossed the scoring system out the window. Without worrying about score, it’s just casual fun, and all the more fun for it (and funnier too, as you’re just laughing at someone and not worrying about points). Yeah the points system is a drag – which is probably why the designers mentioned to drop it in the rulebook 😉 I suppose there to be a scoring system for the more competitive folks. Rich man, small hands… that makes me think Donald Drumpf, but I can’t figure out the sad, androgynous clothes. it’s on the hat specifically. i was thinking Drumpf too, but now i’m stumpfed. I was going for the fact that he’s unhappy with people (men and women) wearing sombreros – Mexicans! I realise it was a bit obscure that. Could have used the wall as well.